My brother, Jonah, and I just want to TALK to the magic mirror -- we're not planning on traveling into any fairytales today. Promise. Except we do wind up going through the mirror, this time into the story of The Frog Prince. 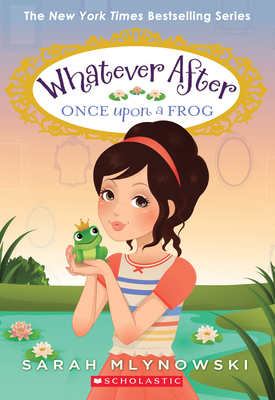 The princess, who's supposed to transform the cute little frog back into a handsome prince, turns out to be super rude. Jonah and I decide we don't want -- or need -- her help. We can take matters into our own hands and turn the frog into a prince ourselves! Can't we? - Kiss a frog (ack)! And there's no time to waste -- let's hop to it! Sarah Mlynowski is the New York Times bestselling author of the Whatever After series, the Magic in Manhattan series, Gimme a Call, and a bunch of other books for tweens and teens, including the Upside-Down Magic series, which she is cowriting with Lauren Myracle and Emily Jenkins. Originally from Montreal, Sarah now lives in the kingdom of Manhattan with her very own prince charming and their fairytale-loving daughters. Visit Sarah online at sarahm.com and find her on Instagram, Facebook, and Twitter at @sarahmlynowski.